From food to fashion and everything in between, the 2017 Global Pet Expo had it all and I was thrilled to be there this year to take it all in! I was glad to see the ever-expanding field of healthy food/treats and health-related products. Probiotics, herbal remedies and hemp-based products are gaining in popularity. 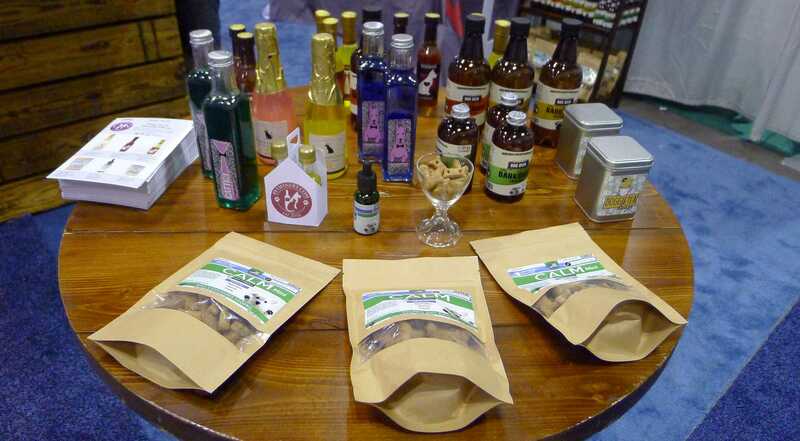 Healthy chews and other products to support oral health were plentiful at the show as well as companies offering mud and mineral-based shampoos and products to promote healthy skin and silky coats. Browsing booth after booth of fun and dazzling dog merchandise was so exciting. There were so many new products and cool things I hadn’t seen before. 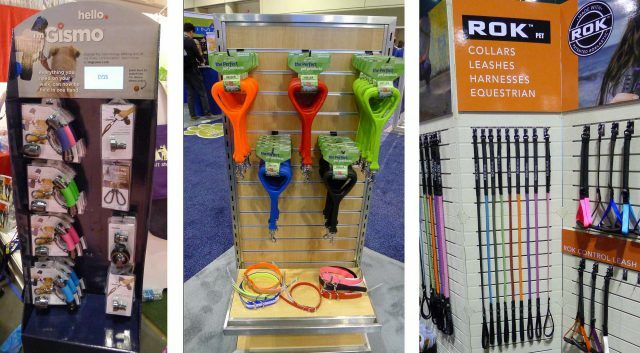 I especially loved seeing all of the accessories designed for active adventure dogs. I’m always drawn to technology products and I wasn’t disappointed with the latest ideas coming from companies from all over the world. 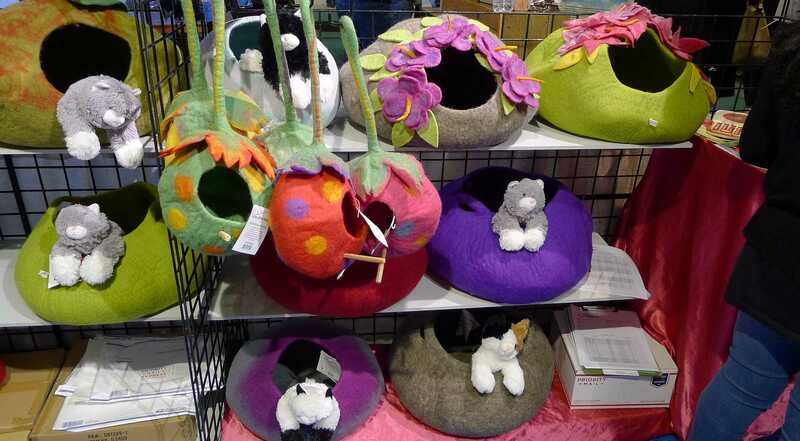 It was hard to narrow down all the wonderful offerings from the show, but here are my favorite Global Pet Expo products for 2017! My Favorite Global Pet Expo Products! Pillstashios – If you struggle with getting your dog to take medication, look no further than Pillstachios! 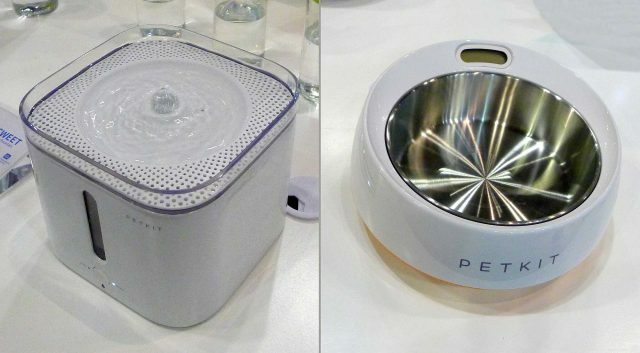 This is a food-based container with Stash, Snap and Serve technology. 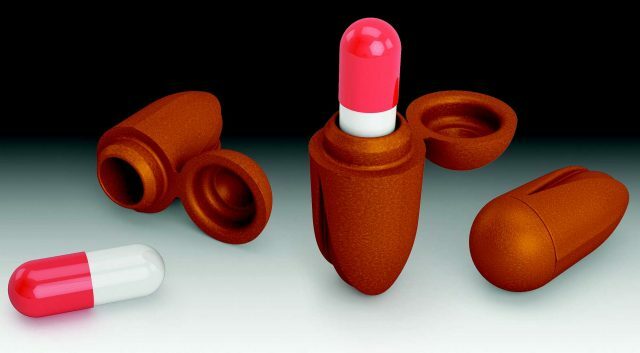 Put your dog’s pill, liquid or powder medication inside, snap it shut and serve. The Pillstashio hides the taste and scent of the pill and comes in Apple Bacon, Blueberry Chicken or Cranberry Turkey flavors. Made in the USA from all natural, grain-free, gluten and soy free ingredients and comes in two sizes. Sleepypod – I’ve been looking for a high quality, safety-tested harness for Haley to use while we’re traveling and I believe I’ve finally found it! Sleepypod makes safety a priority and their products meet the highest safety standards. Every Sleepypod carrier and harness received top safety ratings from the Center for Pet Safety. Their own test dog, Duke 2.0, has even better instrumentation for verifying testing data and improved product design. Their pods can be used as a bed, a carrier, or a safe car seat for traveling. Le Sharma – The colorful, eco-friendly toys and beds from Le Sharma are not only adorable but they’re made from chemical-free, 100% natural wool and dyes and are machine washable. Le Sharma products are handmade from artisan earthquake victim women in Nepal. Bonus: The toys also clean your dog’s teeth! Pet House Candles – Okay, this product is more for you rather than your dog, but if your house is smelling a little “doggy”, One Fur All has you covered. 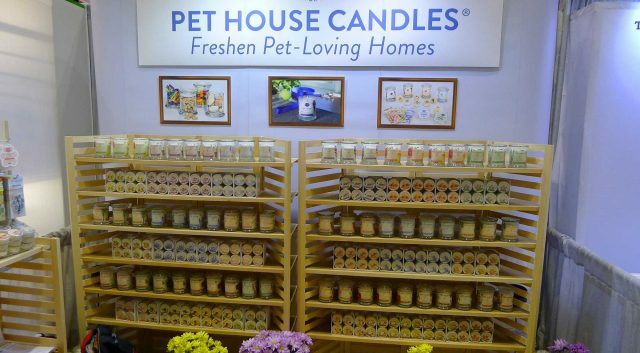 Their soy candles and scent-based products are designed and guaranteed to neutralize pet odors and they’re made with pet-safe ingredients. PetKit – I really like these two Petkit products, the Eversweet Smart Pet Drinking Fountain and the Fresh Metal bowl. The Eversweet quietly circulates and purifies your pup’s water and will send an alert when it’s low. It’s easy to fill and also has a light sensor for even quieter nighttime operation. The antibacterial Fresh bowls come in both metal and plastic models with a variety of designs. They weigh your dog’s food portion and can make feeding amount suggestions. 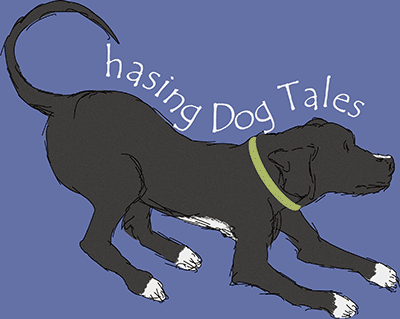 If you struggle with a pulling dog like I do, you’ll love these three products! On the left we have Gismo for you gadget lovers. It’s everything you need for your walk held in one hand (a poop bag dispenser and clip to hold a used bag and a sliding carabiner for a more comfortable walk). Its multi-function connectables option allows you to customize the Gismo for different functions, like adding a flashlight, treat container, clicker or dual leash holder. In the center is a short, bungee leash called The Heeler by BihlerFlex. It’s perfect for when you need to keep your dog close but it will also stretch two times its length for less stress on you and your dog when pulling. It’s made in the USA, has a lifetime warranty and comes in several colors. Rounding out the trio is the Classic Rok elastic leash on the right by Rok. Again, this is perfect for reducing stress on you and your dog when they pull on the leash. I love the colorful designs and matching collars that are available for each design. Himalayan Corporation – If the traditional, hard cheese Himalayan chews are too hard for your dog, there are now some new options for your pup. YakyPuffs are bite-sized chews you puff up in the microwave before serving to your dog. YakyYums are a softer chew with added potato starch and YakyChurros are even softer yet. All cheese products have natural enzymes to help remove plaque from your dog’s teeth and they’re naturally gluten and grain free with lactose removed during the cooking process. Himalayan’s new Leanlix are an innovative and portable, low calorie reward and training tool that can be licked by dogs. 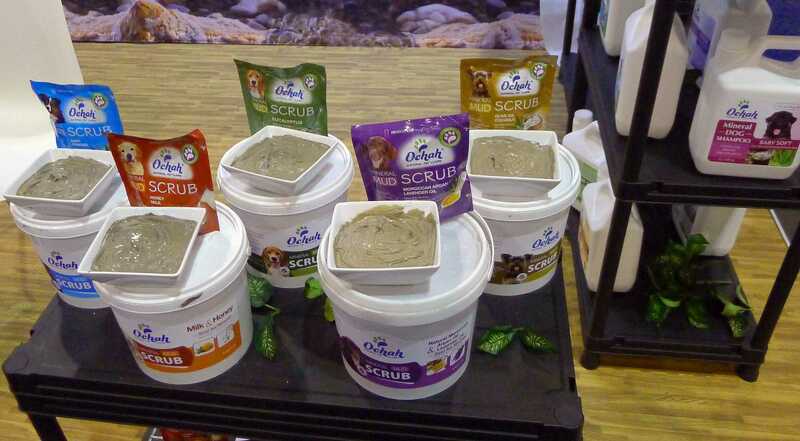 Ochah Mineral Pet Care – I love this line of Dead Sea mineral shampoos and mud scrubs. They are rich in minerals, natural extracts and oils and come in various formulas. The products are also healthy for your pup as they prevent hair loss, repair damaged tissue, promote blood circulation, reduce joint inflammation and stress, and help eliminate dandruff, itching, scratching and hot spots. On top of the health benefits, they leave your dog’s coat soft and silky and your hands soft and moisturized. 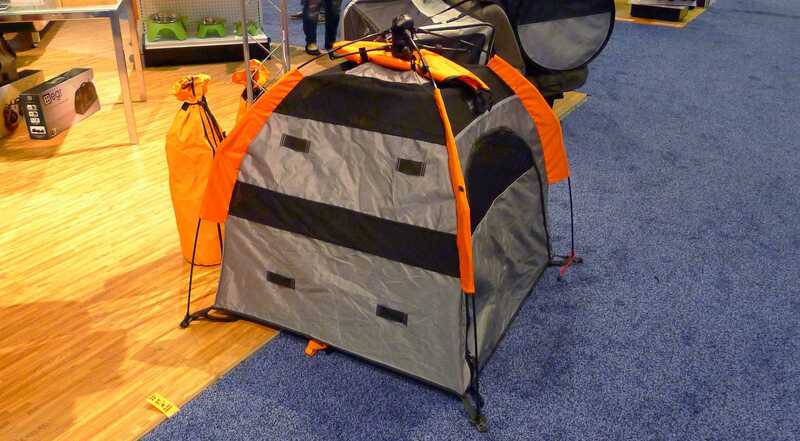 PetEgo – Have you ever seen one of those small demo versions of a tent in a sporting goods store and wished you could buy it for your dog? Now you can! 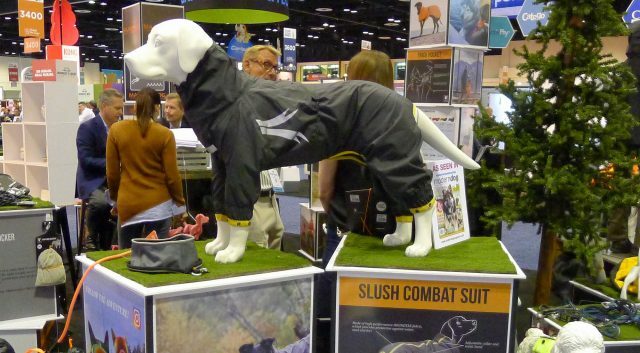 This Italian company specializes in active lifestyle products for you and your dog. The UPet Tent is not only adorable but it’s super functional as a portable pet house, car containment system and outdoor tent. It has claw-proof mesh windows and an umbrella opening and closing mechanism so it pops up in seconds. It includes a messenger bag for easy transport. Even if you’re not a camper, what pet wouldn’t love this as a bed? 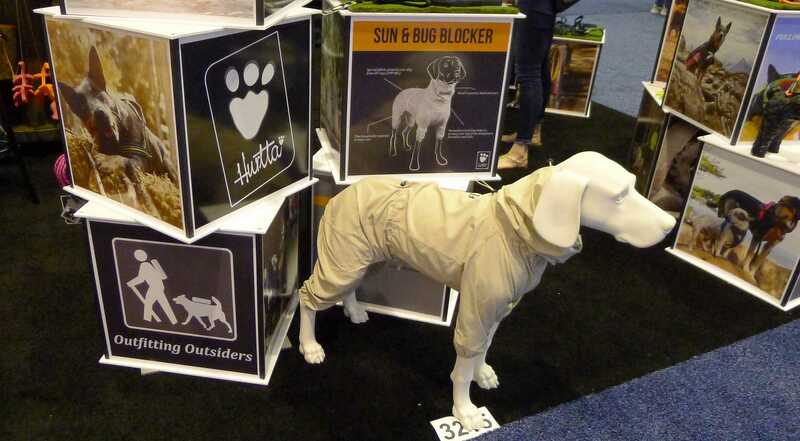 Hurtta – While we’re on the topic of enjoying the great outdoors, Hurtta has a lot of really cool products for active adventure dogs, no matter what the weather. Their Slush Combat Suit and Sun and Bug Blocker are just a few options they offer. I can think of several occasions when both of these would have come in handy for Haley. 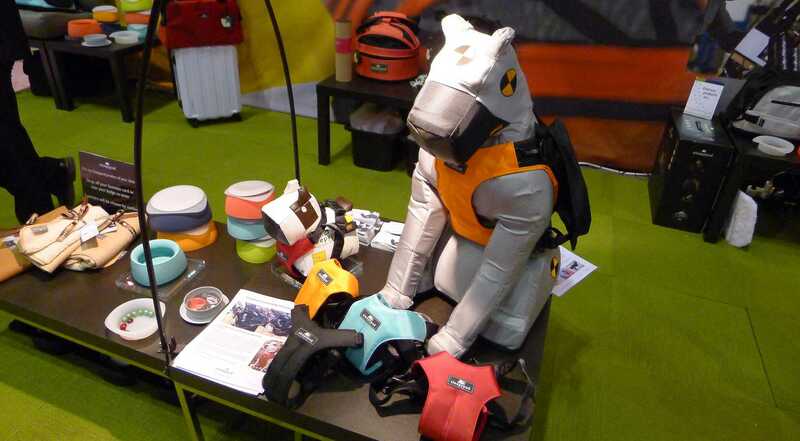 Hurtta also offers a full range of products from rainwear, clothing, cooling products, leashes, harnesses and collars. 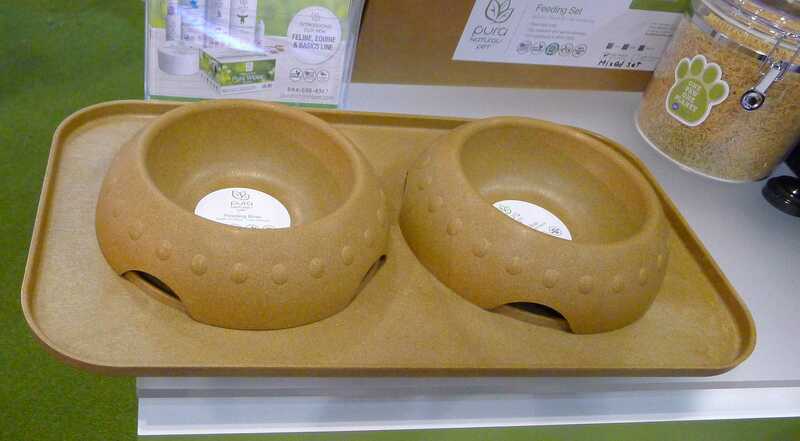 Pura Naturals Pet – This feeding set caught my eye because of its eco-friendly design and feeding tray. They are made from American-grown rice hulls and are non-skid, formaldehyde and BPA free, dishwasher safe and made in the USA. The unique design means it’s less likely to support mold growth and I like how the bowls fit into the grooves on the tray so they don’t slide around. The set comes in three different colors. 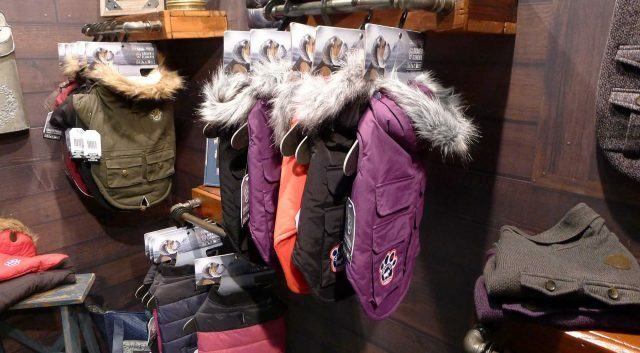 Canada Pooch – Your pup can stay warm in style with the quality jackets, vests, sweaters, rainwear and boots offered by Canada Pooch! None of their products are made from any animal-derived materials and you can be assured these items are both highly fashionable and functional. 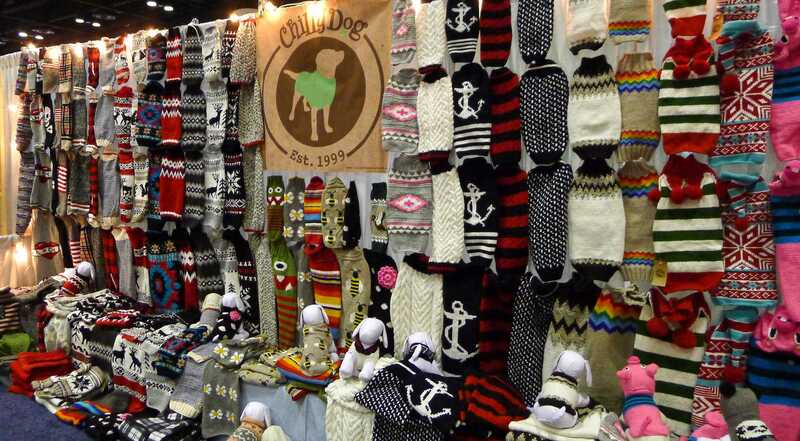 ChillyDog – Speaking of chilly dogs, Chillydog also carries a wonderful line of sweaters and accessories for chilly dogs. 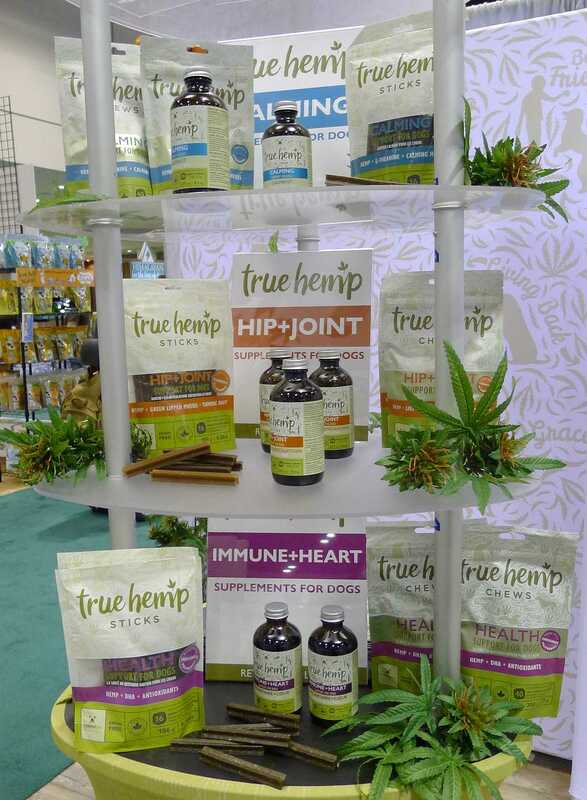 TrueLeafPet – There are two lines of products from True Leaf Pets, a hemp-based (non-CBD) line and their new oregano-based line of products. Don’t worry, hemp is not marijuana and won’t get your pet high, but it does offer potential health benefits for dogs with anxiety, arthritis/joint issues, seizures, pain, skin issues, inflammation, digestive issues or cancer symptoms. 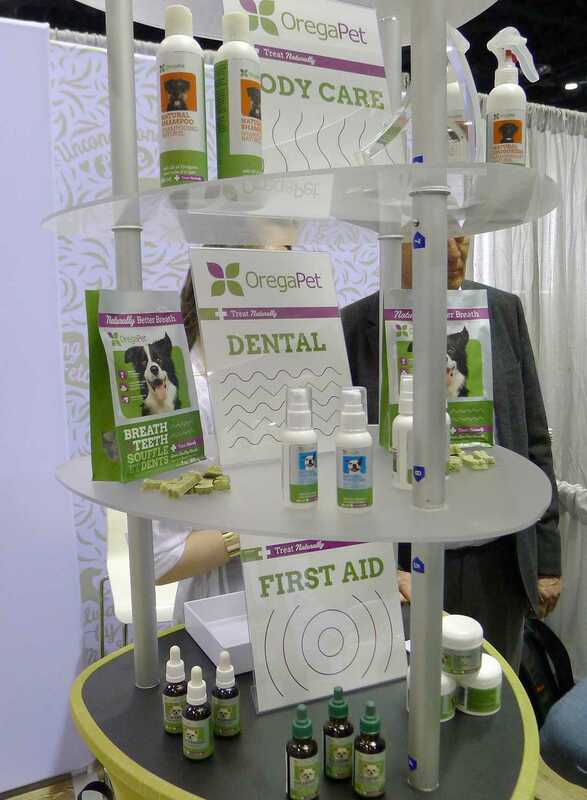 The oregano line of products are beneficial for ear care, oral health and skin/coat health. PetRageous Designs – PetRageous makes some really fun products for your pooch and I particularly like the design of their ThinkRageous Treat Bank. It’s perfect for dogs that tend to master treat dispensing toys too quickly. 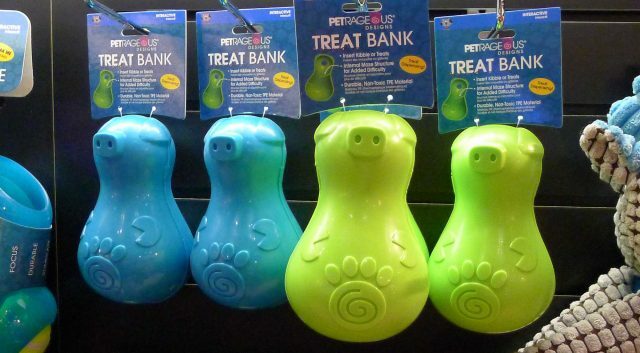 It has an internal maze for treats which means your pup has to work longer to get those yummy tidbits to come out. Molly Mutt – Your dog will love being close to the scent of your old clothes or pillows and you will love the beautiful cover designs that Molly Mutt has to offer. The eco-friendly bed design makes it easy to wash when necessary. There’s also an optional inner armor liner and pillow pack for more comfort. The names are the same but the companies and products are different. 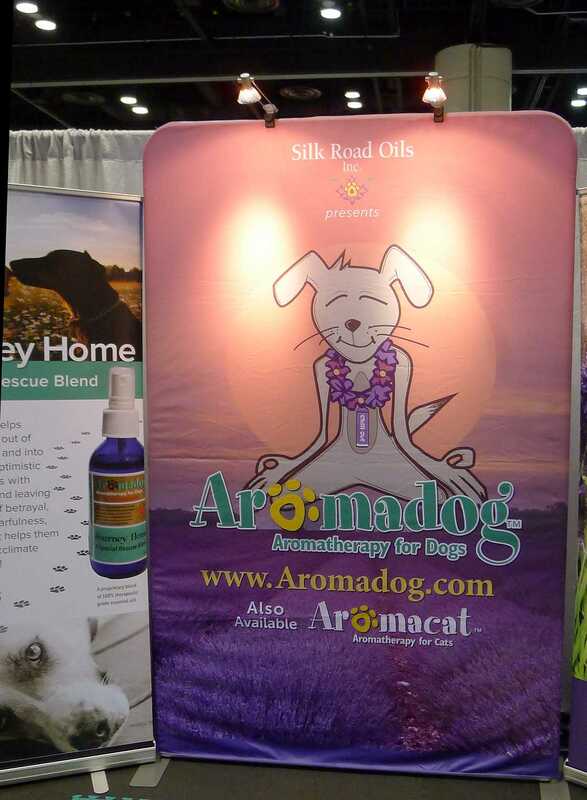 On the left is Aromadog (Silk Road Oils) specializing in aromatherapy products. They offer a full range of fine products made from human-grade oils, including their popular Chill Out oil. 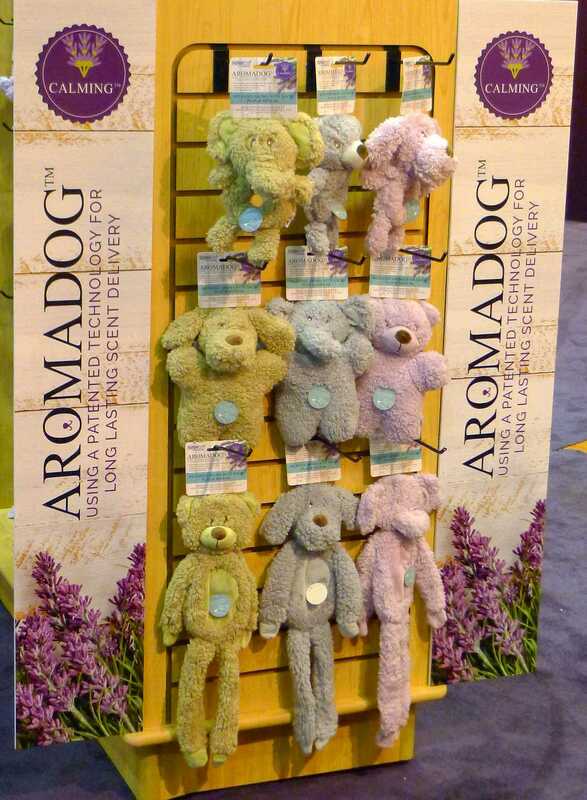 Aromadog on the right is a product line of stuffed toys by McCann Pet Group that deliver long lasting scent to help dogs with excess energy or separation anxiety. Dogs Love Kale – Kale for dogs? Yes! 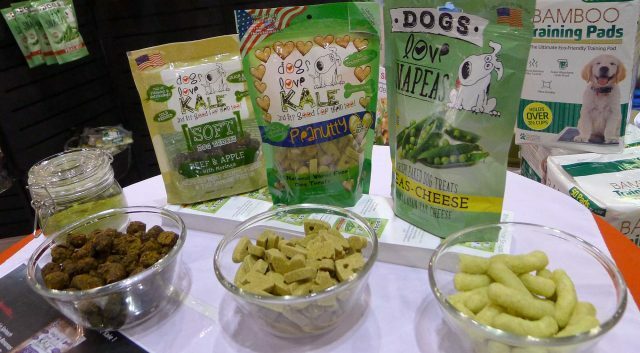 Paula Savarese and Dawn Ward teamed up to bring your dog healthy kale and snap pea treats that are full of vitamins and antioxidants. Not only are they healthy, but they’re human grade and low calorie snacks made right here in the USA. These are great limited ingredient treats for dogs with allergies or digestive issues! Healthy Essentials Probiotic Food Spray – We’re all discovering how valuable probiotics are for us humans and our pets alike and now there’s a convenient way to dispense a daily dose onto your dog’s food. This all natural spray contains 11 strains of live, active probiotics. The spray tastes great, is cost effective and doesn’t need to be refrigerated. PetCakes – There’s no need to wait for a special occasion or your dog’s birthday to treat them to a special doggie dessert. 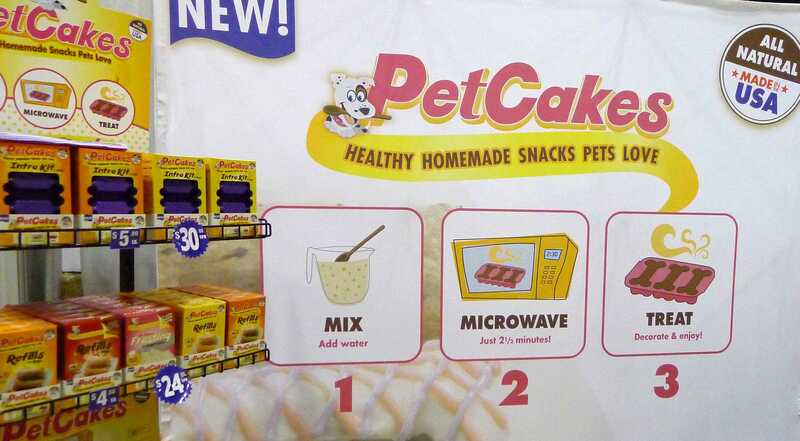 PetCakes are the first and only microwavable treats you can make at home in minutes. They offer cake mixes and molds and also a new line of frozen treats. 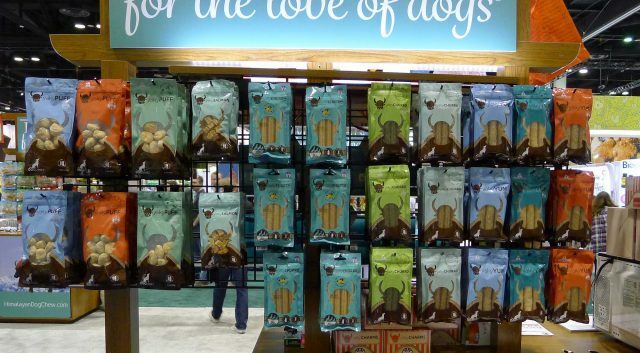 PetCakes are vet approved and contain human-grade ingredients but no corn, wheat, soy, salt, sugar or preservatives. 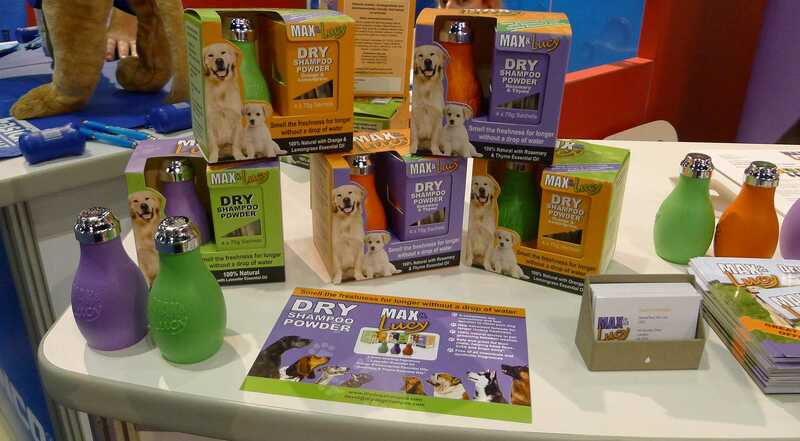 Max & Lucy Dry Shampoo – This dry shampoo is perfect for when your dog needs a quick freshening up or when it’s not convenient to give them a full bath. Just fill the bulb with the essential oil encapsulated powder then squeeze the bulb onto your dog’s coat and massage. No water is needed and it comes in three fragrances: Lavender, Orange & Lemongrass, and Rosemary & Thyme. The powder contains no chemicals or synthetic fragrances and the Rosemary & Thyme version even helps keep ticks and bugs away from your pup. 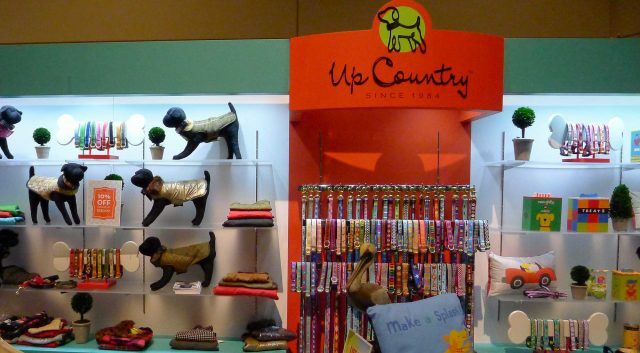 Up Country – One of my favorite fashion accessory exhibitors was Up Country! For 30 years they’ve been creating and selling their stylish line of pet products of over 120 collar designs and dozens of lifestyle accessories. Most of their products are hand sewn, pressed and finished in Rhode Island. Their attention to detail and the fact that they stand behind all of their products makes them an expo favorite. SpunkyPup – The new Wibbleez from Spunky Pup looks like a winner for Haley! They squeak, they stretch, they’re durable and they’re super cute. 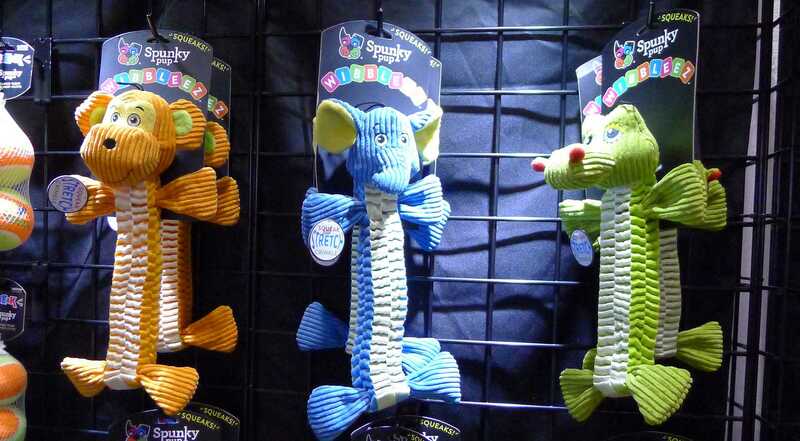 As a matter of fact, the whole line of Spunky Pup toys look really fun and interesting. PAWS Pizzeria – You no longer have to feel guilty while eating pizza in front of your pooch. 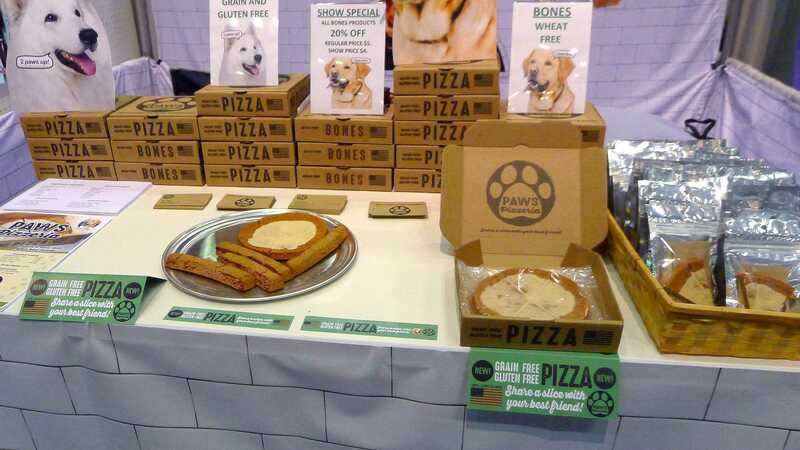 Order their very own Dog Pizza or order by the slice. The pizzas are grain free and made from chicken and sweet potato, all sourced and made in the USA and only 70 calories a slice. So go ahead, share a slice of pizza with your best friend! PetWinery – What’s pizza without a beer to go with it, right? Have your dog belly up to the Dog Bar at the Pet Winery and order him a vitamin-enriched, non-alcoholic Bark Brew or Dog Perignon. 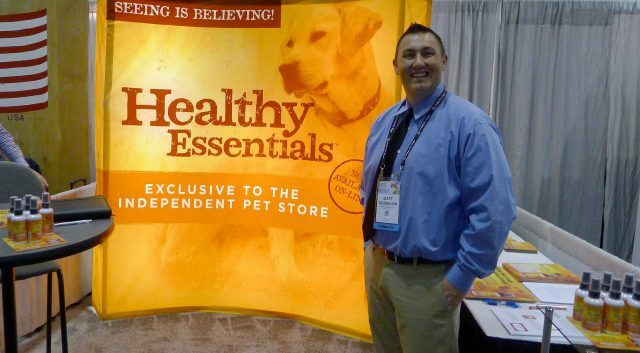 All PetWinery products are 100% organic, sourced from the USA and manufactured in an ISO7 food-grade clean room. The Bark Brew also has glucosamine for hip and joint health. The Global Pet Expo featured a vast number of pet food companies and most of them offer quality, healthy options for your pet’s diet. I usually don’t offer recommendations or reviews on food but Carna4 and Blackwood are two companies that I might look into further. Carna4 offers quick-baked and air-dried real food with no synthetics. Blackwood offers all-natural, handcrafted, small batch slow-cooked food that’s made in the USA. 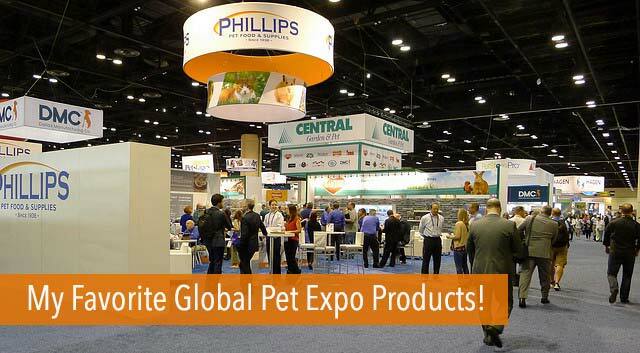 This year’s Global Pet Expo was a huge, record-breaking success and I loved every minute of it! Unfortunately, Haley wasn’t allowed inside but she was rewarded for her patience with lots of treat samples and plenty of romping and swimming on the beautiful beaches of Florida. There were so many wonderful exhibitors at the expo. I wish I had room to highlight many more of them here but watch for some additional posts later this year as I take a closer look at some other products featured at the show. If you’re interested, here’s a look back at highlights from the final day. I can’t wait to attend again next year and to my fellow bloggers, I hope to meet up with you there next March! What type of new products do you love finding for your dog? Wow! It’s like being at the Expo! Thank you for giving those of us who couldn’t attend such an amazing chance to see it! You’re so welcome! I hope you get a chance to go one day, it really is amazing. WOW! What wonderful sounding products. Looks like Google and I will be spending some quality search time looking up some of these products. I’m glad Haley got to have a little fun in the sun with you. Thanks, Sharon! We had a great time and I can’t wait to order a few of these things for myself. First on the list are those bungee type leashes, haha! Wow so many great products! There are quite a few that I need to check out further. Love! I’m bummed I couldn’t go this year, so thank you for bringing the Global Pet Expo into my living room 🙂 How awesome that Miss Haley got to come along and enjoy the beaches, too! I LOVE the look of that Slush Combat Suit – that’d be great for Buzz to keep him mud and slime free when he plays ball in the yard. I’ll have to check it out! The Sleepypod harness and Pillstashio sound very interesting, too. A number of these we have tried. Love the Molly Mutt bed, but not a fan of Pet Cakes at all. The cat caves that you featured are the best I have seen. We have a cat cave that we featured quite some time ago but it wasn’t embellished in a pretty way like the ones that you featured. Great recap! Wow what a great recap & what fun new products. Several you mention have caught my mom’s eye for our Basset, Bessie. I told her we need the candle to mask the stale potato chip smell coming from Bessie! Tee hee hee. I purr-sonally would like to have a Le Sherma bed. I love the colors it comes in! Thanks for sharing! Some very cool products! I saved some of the websites. I think my small dogs would love the kitty caves, and we’ve had our eye on Sleeypods for awhile now. The pet fountains are cool too. I’d love to get my boys a new fountain, if my 1 year old pup ever decides to figure out that water bowls/fountains are not for playing in. So do I! For me it would be like the pet parent’s version of Disney World. 😀 And I would love to finally get to meet you too!! So many fun products, my favorites are new bow ties or funky hats and sunglasses to wear! Thank you for sharing – WOOF! What a great time you had, so many cool products, thanks for sharing. Some cool stuff! Of course, Up Country is our go to for fashionable collars, and we have seen that pop up tent like crate at lots of dog events lately. Super cool. Maybe one day we will make it to Global. Wow! 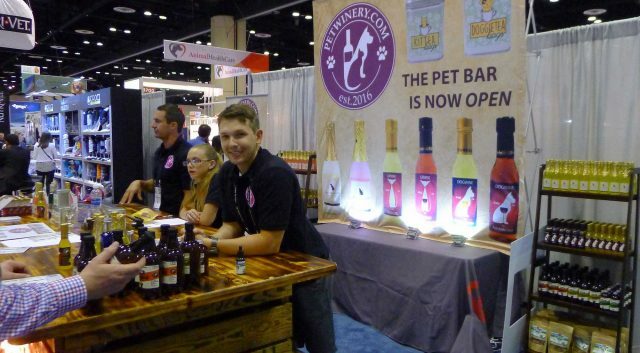 Looks like you had a great time at the Global Pet Expo! I say it every year, but one of these days I’m going to make way out there. Two products that I’ll probably try out are the Sleepypod harness and the new Himalayan dog chews. Thanks for sharing all of these great new products. I was so impressed with Sleepypod and their commitment to safety. I hope you like the harness and hopefully you can make it to the Expo in Orlando one year! Wow! That’s an amazing array of different speakers with very different types of products. I’ll admit that I’ve seen some of these names before (like Chilly Dog, which I love). But some are totally new to me. I hope my local pet store is paying attention. I might start asking for some of this stuff! That was one of the more interesting things about the show. I never realized how many companies only sell their goods to small, independent pet stores. It would certainly pay to ask your local store about any products you might be interested in. Unfortunately, we don’t have very many small pet stores in our area. Wowza, that’s a lotta good stuff! 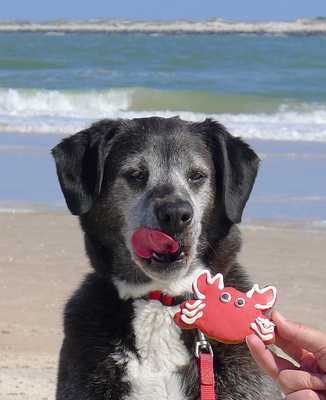 Love the photo of Haley with her cookie on the beach! Rita LOVES anything from Himalayan Corp, and those Pillstachios look like a great idea! Has Rita tried the softer Himalayan chews or does she like the original versions that are harder? It’s so cool that they now make different types! WOW, so many amazing products! This expo really shows how quickly the pet industry is growing. I’m going to have to bookmark this so I can come back and make a list of the products I want to look more at! It really is growing and it’s interesting how health and food trends with people carry over to the pet world. I had to wonder about a few of the products I saw there, but it’s so interesting to see what’s available now. I haven’t heard of many of these products, but they all sound great. I think that the Pillstachio is a great invention.